Bespoke Investment Group uses an interesting term to describe recent stock market action: "all or nothing." In the stock market, "all or nothing" days occur when at least 80% of the stocks in the S&P 500 index advance or decline. "The frequency of all or nothing days in the S&P 500 over the last 15 trading days is unheard of," [according to a Bespoke market researcher]. "Using our breadth data going back to 1990, we have never seen a 15-trading day period where the S&P 500 saw as many or more all or nothing days than it has in the current period." Specifically, there were 11 of these occurrences in the 15 trading sessions. Also, in a one-month period, the CBOE Volatility Index jumped 120%. Yet -- the panic we saw in the market in late August proves that few traders saw it coming. 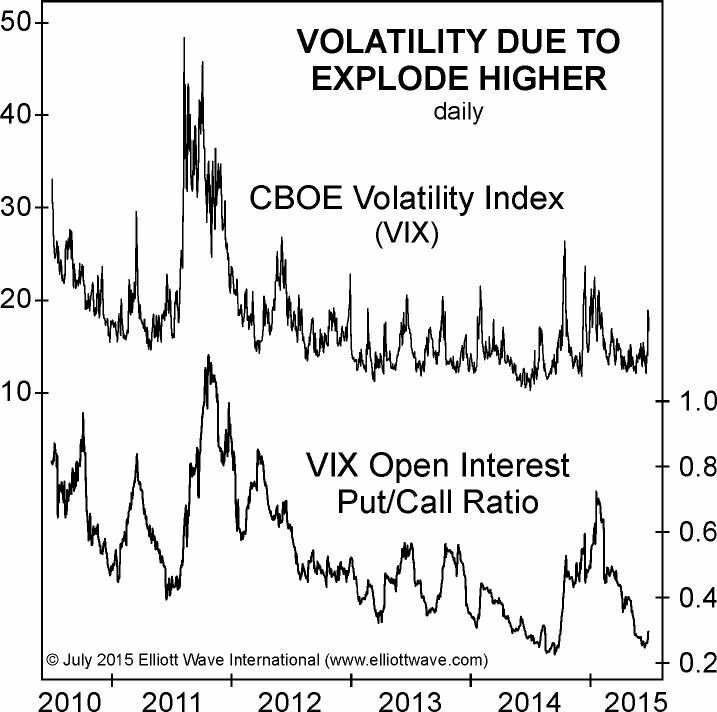 When the stock market's decline kicks into high gear, volatility will spike to record levels as will the p/c ratio. The era of low volatility will be replaced by head-spinning stock market moves that will shake global stock markets to their foundation. You remember what soon followed: Stocks fell hard, and on August 24, the S&P cash index saw a selloff low of 1867.01. Since then, as our September 11 Short Term Update chart below shows [wave labels available to subscribers], trading volume has steadily contracted. 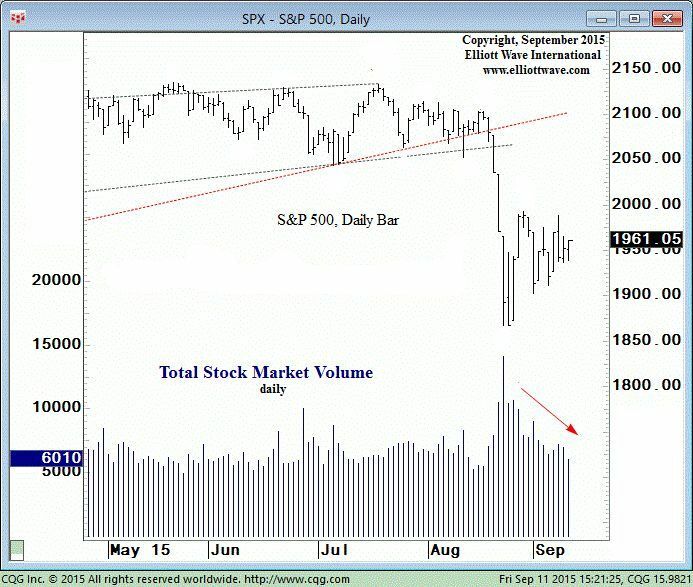 Some stock market bulls are bolstered by the lull in trading volume. 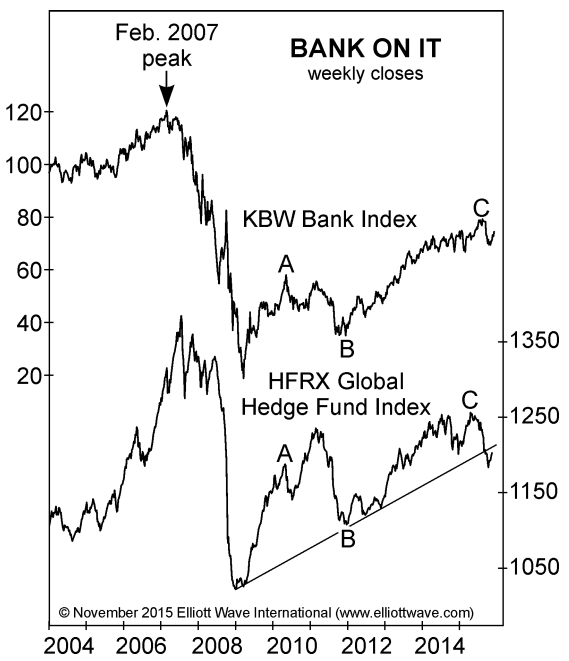 But know this: Our indicators strongly suggest that now is not the time for such confidence in a continued uptrend. We expect the number of "all or nothing" days, to use Bespoke's term, to increase dramatically when volatility returns. These are just a few examples of the insights that EWI brings their subscribers every month. See below how you can read the complete August Theorist -- FREE. If you invest in U.S. stocks, please stop what you're doing, sit down and pick up Robert Prechter's Aug. 19 investment forecast. Prechter published one of the most widely read investment letters of the 1980s, and he remains one of the most widely known market technicians in the world. On Aug. 19, before the latest spike in volatility, he warned of "pandemonium in the stock market" and a "stunning decline in US stock prices." Now you can read his complete, subscriber-level report that predicted what you see today. This article was syndicated by Elliott Wave International and was originally published under the headline U.S. Stocks: Volume, Volatility -- and What Should Come Next. EWI is the world's largest market forecasting firm. Its staff of full-time analysts led by Chartered Market Technician Robert Prechter provides 24-hour-a-day market analysis to institutional and private investors around the world. Technical versus fundamental analysis: Which approach yields better investment results? A new study by three finance professors offers an answer. In the nine months following each recommendation, the stocks technical analysts identified as strong buys on average outperformed the broad stock market by 7.9%. The stocks they mentioned as strong sells underperformed by 8.9%. By contrast, the strong buy recommendations from fundamental analysts underperformed the overall market during the same timeframe. 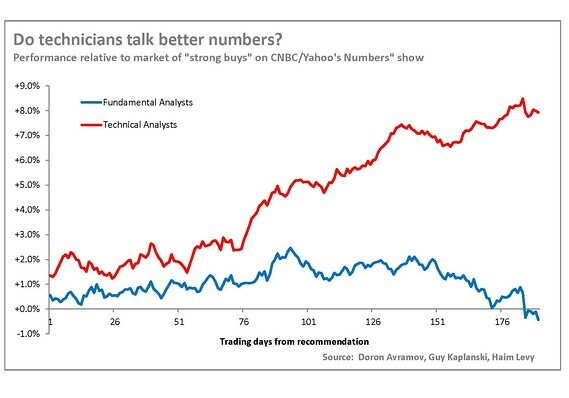 More than that, the fundamental analysts' strong sell recommendations performed closely to their strong buys. Technical analysts were the clear winners. Elliott wave analysis of financial markets is a specific form of technical analysis. The decline from yesterday's highs -- 17,568.40 in the Dow and 2103.46 in the S&P -- is impulsive (i.e., five waves) ... The impulse wave down indicates that the next larger-degree of trend is down. ... The weakening internal measures of breadth, volume and momentum are bearish. ... Nearly every index declined in unison, each breaking their respective lows from Wednesday morning's weak open. ... At today's intraday lows, there were more than five stocks down for every one up on the NYSE. The up/down volume ratio was lopsidedly bearish too. ... The closing a/d was 0.33:1, with three stocks down for every one up. Down volume on the Big Board was 81% of up plus down volume. ... When will selling pressure again materialize to drive prices significantly lower? The answer is that it's starting to materialize now. The S&P 500 gapped lower at the open during the next two trading sessions (August 20-21). On August 24, the intraday low for the S&P 500 was 1867.01 -- down nearly 13% from its May 20 peak. The Dow's intraday low was 15,370.30 -- down 16.4% from its May 19 peak. After the Labor Day weekend (Sept. 8), stocks traded well above those lows. But beware: The Elliott wave model and other technical indicators suggest that more market turmoil is ahead. Technicians tend to rise in prominence in bear markets, and they appear poised to do so again. Financial media use news and economic events to explain market moves. Steer clear of this misguided approach. Learn what really moves the markets with The Elliott Wave Crash Course. In this series of three FREE videos, Senior Tutorial Instructor Wayne Gorman demolishes the widely held notion that news drives the markets. Each video will provide a basis for using Elliott wave analysis in your own trading and investing decisions. This article was syndicated by Elliott Wave International and was originally published under the headline Stock Market Forecasts: Why You Should Consider Technical Analysis. EWI is the world's largest market forecasting firm. Its staff of full-time analysts led by Chartered Market Technician Robert Prechter provides 24-hour-a-day market analysis to institutional and private investors around the world. "I always will be an Elliottician, but other technical tools have merit and are indeed worthwhile: they allow me to build a case, build a more confident reason for making a forecast and for taking a trade; making a trading decision." I recently asked Elliott Wave International analyst Jeffrey Kennedy to name his 3 favorite technical tools (besides the Wave Principle). He told me that Japanese candlesticks, RSI, and MACD Indicators are currently his top methods to support trade setups. In this 3-part series, we will share examples of how to use these 3 tools to "build a case" in the markets you trade. These practical lessons allow you to preview how Jeffrey applies techniques with proven reliability to support his analysis. 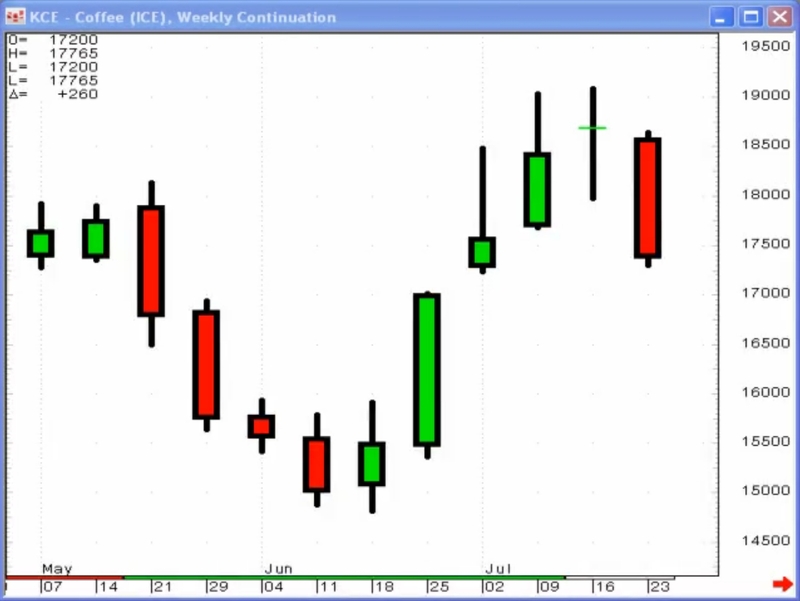 We begin this first lesson with a basic candlestick-style price chart. You may be familiar with an Open-High-Low-Close (OHLC) chart: comprised of vertical lines with small horizontal lines on each side. The top of each vertical line is the high and the bottom is the low. The small horizontal lines on either side represent the open and close for that period. Japanese candlestick charts employ the same data that OHLC price charts do except that the data is expressed differently. The real body is the range between the open and close, and appears as a small block. Shadows are the lines that extend upward and downward from this block, and represent the highs and lows. Next, take a look at the chart below. Two bearish candlestick reversal patterns that Jeffrey finds highly reliable are the Evening Star and the Bearish Engulfing Patterns. 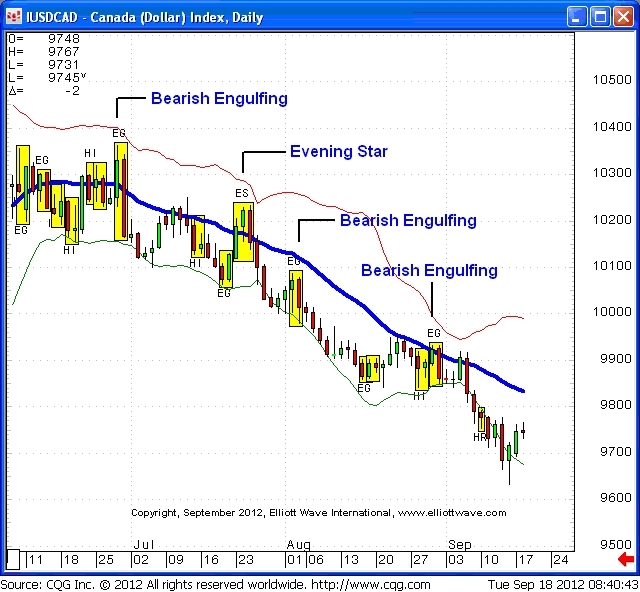 This weekly continuation chart for the Canadian Dollar combines a 20-period moving average to show that the trend is down -- allowing you to focus on bearish reversal candlestick patterns to spot trading opportunities. Jeffrey notes that "combining these reversal patterns with moving averages makes them even more dynamic because they focus your attention in the direction of the larger trend." Japanese Candlesticks begin our spotlight on Kennedy's top 3 ancillary tools for trading with the Wave Principle. Over the next two weeks, we'll share parts two and three-- how Kennedy uses RSI and MACD Indicators to support his Elliott wave interpretation. If you are interested in learning how to become a more successful technical trader, get more lessons like this in Jeffrey Kennedy's free report, 6 Lessons to Help You Spot Trading Opportunities in Any Market. 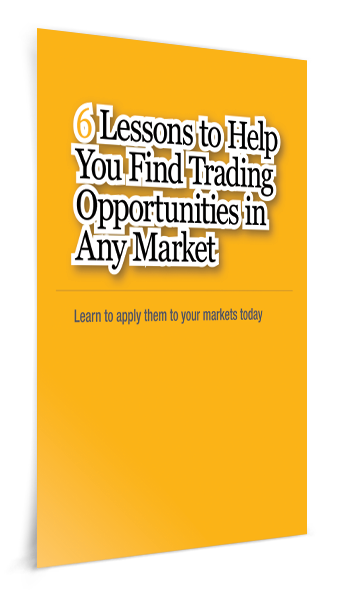 This free report includes 6 different lessons that you can apply to your charts immediately. Learn how to spot and act on trading opportunities in the markets you follow, starting now! This article was syndicated by Elliott Wave International and was originally published under the headline Top 3 Technical Tools Part 1: Japanese Candlesticks. EWI is the world's largest market forecasting firm. Its staff of full-time analysts led by Chartered Market Technician Robert Prechter provides 24-hour-a-day market analysis to institutional and private investors around the world. (Video) Housing Market: Is the Roof About to Cave In (Again)? Editor's note: This video was excerpted from a new multimedia report, "The New Financial Theory that Could Make the Difference in Your Investing Success," from Elliott Wave International, the world's largest financial forecasting firm. Authored by Robert Prechter, the full report demonstrates the failures of the modern investing paradigm and suggests a radically new approach that can make the difference in your investing success. Click here to read and watch the full, four-part multimedia report -- it's free. The director of the Socionomics Institute, Mark Almand, came up with an analogy to help explain socionomic causality in people. And I'm so jealous that he came up with this idea, because it's so cool. I just love it. So I'm privileged to be able to embellish on it and present it to you now. It goes like this: Suppose you got a job -- you're down and out, you finally got offered a job, so you take it -- as a sentinel on an oil rig in the Gulf of Mexico. Your bosses tell you, "Look, we just want you to watch the seas all the time. We don't know what could happen -- maybe some radical greens might come up -- so we just want you to keep an eye on things. Just let us know if there's anything out of the ordinary." Well, you can't stay awake 24 hours, so you've got another guy who's doing it with you, and you trade shifts. And so you're out there, and you're looking at the ocean, and everything is calm and normal, when all of a sudden, over toward the left side of the horizon, you see this little group of people, apparently standing on top of the water. You watch for your eight-hour shift, then you come back the next day, and you notice they've moved a little bit farther. So you're watching this, and as the days go by, you see this little group of people, and they're not swimming; they're not really walking; they're just standing around on the water. But they're moving around as the days go by. After a few more days go by, you notice a barge floating out in the sea. So you start talking to your buddy about this. You say, "Look, I've noticed that these people seem to be floating around; they're moving around the ocean. And I noticed this barge out there. It always seems to be about the same distance from the people, but I can't tell if there's a relationship between these two weird things happening. Tell you what: When I'm on, I'm going to take this big blackboard here, and I'm going to write on it. 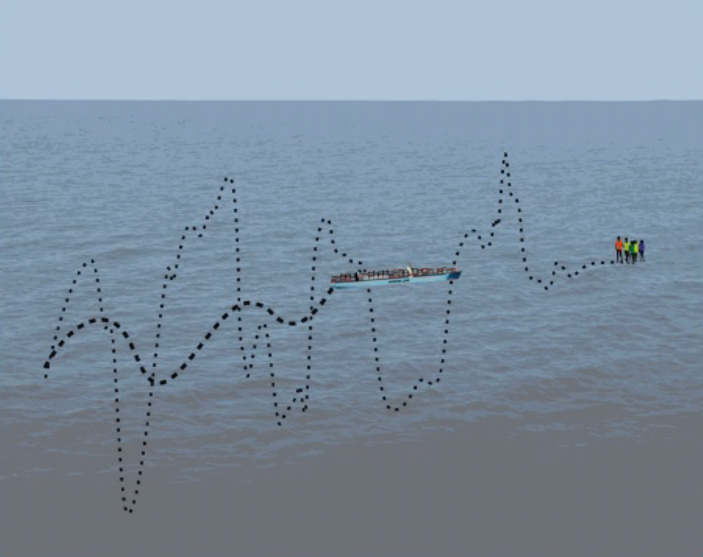 I'm going to follow the path where the people are going and the barge, and then when I'm sleeping and you're up here, you do the same thing, and we'll sort of graph it and see what we end up with." So they agree to do this. Pretty soon, this is the picture that they've drawn. The dotted line is the path that the people have taken, moving around on the surface of the water. And the dashed line -- the thick dashed line -- is the path that this barge has taken. And sure enough, the people are still there every day, and the barge is still there every day, and they're just doing these seemingly random moves, but the barge is still back there. You start thinking, "What could explain what's going on here?" Your friend says, "Well, I've been thinking about it, and I've got a theory." He tells you his theory, and you kind of look at him oddly, and say, "Well, that's kind of a weird idea you have." And here's the theory that he gives you: The barge has its own engine and goes where it wants. The people are psychic, and they are anticipating where that barge is going to go. They don't do it perfectly, so they kind of wander around in front of it. But as the barge follows, it proves that they have foreknowledge of where that barge is going. And that's my theory." You say, "Well, I've been thinking about it, too. I have an explanation for this, because I really don't believe people can walk on the water, and you're kind of accepting that as magic. I don't think people are psychic, either. You're kind of accepting these ideas, but I think, somehow, we have to deal with reality here. So I have a different idea. "I'm a socionomist, and here's the way I see it: There must be a hidden variable, something we can't see that's making this pattern happen. I'm postulating there's a submarine under the people. They're not walking. They're not swimming. They're just standing around. And there's probably some sort of towing device, a chain or something, between the submarine and the barge. And this kind of explains it: Wherever this submarine wanders, that chain pulls the barge, but it doesn't follow immediately. It's not on the exact same path, because this is a long distance, so it's kind of roughly following in the same path." He tells you, "You're crazy!" I don't see any submarine. And you say, "Well, no, we can't see it. But this would explain it without the magic, without the psychic stuff and the walking on water; you know, everything is taken into account." "I just can't see it," he says. Well, why am I showing you this analogy? Because this is exactly what we get in terms of the way economists explain what the stock market is doing. They say the economy is the driver, and the stock market follows in advance. How does it do that? Investors are psychic. Seriously. They say investors are looking into the future, three to six months, and they're buying or selling their stocks in accordance with what they will do. The economy is running on its own. It's got its own engine, and these people are just somehow psychic. They know what the economy is going to do three to six months in advance. And that's the accepted explanation for why the stock market is a leading indicator. On the other hand, socionomic theory says social mood is the driver. The stock market leads, because its follows directly from social mood. And the economy follows at a distance, because it takes times to make economic decisions. There's no magic, no psychic. One thing follows another. It is direct causality. I kind of like that, because I think it puts things into perspective. Most of the economists are saying, "You guys are on the fringe." Well, I think when you look at this kind of explanation, maybe it's they who are on the fringe. 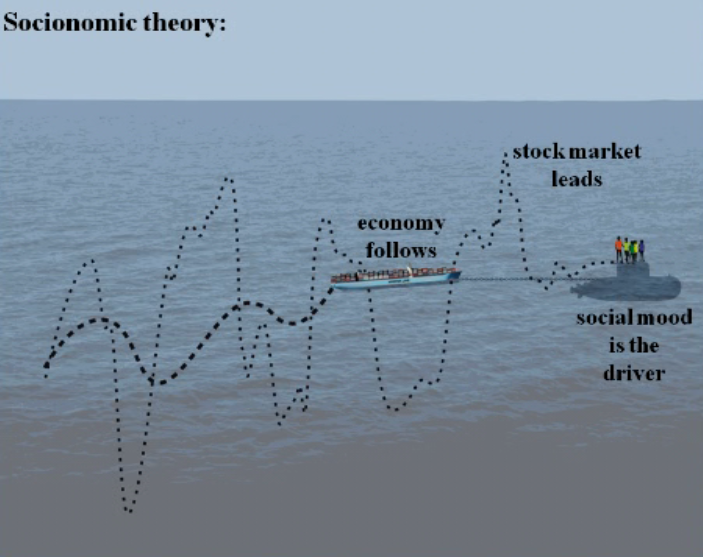 This article was syndicated by Elliott Wave International and was originally published under the headline (Video) Socionomics Explained: The Hidden Engine Behind Society and its Markets, and the Science that Helps You Navigate Both Safely. EWI is the world's largest market forecasting firm. Its staff of full-time analysts led by Chartered Market Technician Robert Prechter provides 24-hour-a-day market analysis to institutional and private investors around the world.